While large chunks of the UK may not agree, League of Angels III aficionados will know that Theresa is indeed a hero. Which is why the game is putting on a special event in her honour. Of course, we’re not talking about the embattled UK Prime Minister, but the flame-haired hybrid child of Prime Angel and Dragon King Ulysses. In League of Angels II, Theresa’s life was full of conflict and uncertainty (ok, still the odd similarity) due to her special heritage. Essentially, she’s not had it easy — but League of Angels III is celebrating her kind, albeit rebellious, disposition with a special in-game event that players can find right now when they log into the game. So, let’s all celebrate Theresa for a change! 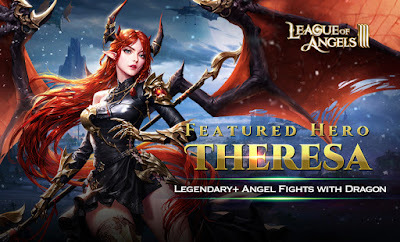 League of Angels III has also seen some big improvements recently: in version 4.0.0. the Guild War game mode has been rebuilt, with some new rules and upgraded rewards. A first Mythic Hero has been added, Victoria in the new Temple — Nebula. January also saw a new Mount arrive — Night Falcon. One of the few flying mounts, Night Falcon grants a sharp rise in the battle rating of your heroes while also adding a huge amount of bonus HP, ATK and DEF. He also has fearfully sharp feathers and an imposing appearance; which doesn’t do any harm, right? This legendary mount can be obtained via the Wheel of Fortune. January’s earlier New Year celebrations saw League of Angels III invite players to enjoy Angel’s Carnival — a holiday event whose origins go all the way back to Mikaela and Glacia’s reunion. Included among some tokens for turkey dinner and pumpkin pie is a new outfit, Silverfrost.